Looking for an easy way to increase your Amazon affiliate income from your niche site? Link localization, or geo-targeting, is the answer that you’re looking for. In case you don’t already know, when a visitor outside the USA clicks on your Amazon.com affiliate link but ends up buying the product on their local Amazon site (Amazon Canada, Amazon UK, etc. ), you don’t get any credit for sales on the other Amazon sites. But, you can get credit for those sales by implementing a link localization script or plugin on your site. What Is Link Localization (Geo-targeting)? How Does GeniusLink Help With This? Is Geniuslink The Only Way To Get Link Localization? How Do Link Localization Plugins & Scripts Work? When you’re using a link localization script or plugin, a visitor gets routed to the proper Amazon site for their location. For instance, someone in Germany will get sent to Amazon.de instead of Amazon.com. The reason that you want to implement this on your site is because most non-US shoppers will purchase on their local Amazon instead of Amazon.com because the shipping cost will be better for them. So, if you’re getting visitors to your site outside of the United States, then you’re potentially leaving money on the table that could be going into your bank account! Each month I earn an average of $500 from the international Amazon Associates programs thanks to using Geniuslink on my sites! For a small monthly fee, Geniuslink will send your site’s visitors to their local Amazon site whenever they click on one of your Amazon links. As long as you have set up an account with each international Amazon site, and input that information into your Geniuslink account, then you can earn when sales are made on the other Amazon sites. There are a variety of plugins and services that offer link localization scripts that you can use. Geniuslink is just one of those. However, it does have the distinction of being specifically mentioned on the Amazon Associates UK website – proof –> https://affiliate-program.amazon.co.uk/promotion/geotargeting/258-8029266-6548036 I’ve tried a few other options, but Geniulink is my #1 recommendation for Amazon Associates link localization because it is very easy to implement at an affordable monthly cost. EasyAzon is another popular option for link localization, but I haven’t personally used it. You’ve probably heard of it before as it’s been around for years and was created by Chris Guthrie. This is also a WordPress plugin that makes it easy for you to add in Amazon links in your posts. From what I’ve heard, EasyAzon is updated regularly, which is one of the reasons that it’s used by so many people. I’m also under the impression that it is a one-time fee, which is obviously a good thing! The AAWP plugin is another popular option that hasn’t been around that long, but is gaining a great reputation among serious niche site builders that I talk to. This plugin is made by a German developer, but has all the necessary documentation in English as well. What I really like about this one is that it gives you lots of options to make really attractive looking Amazon CTAs for your readers. 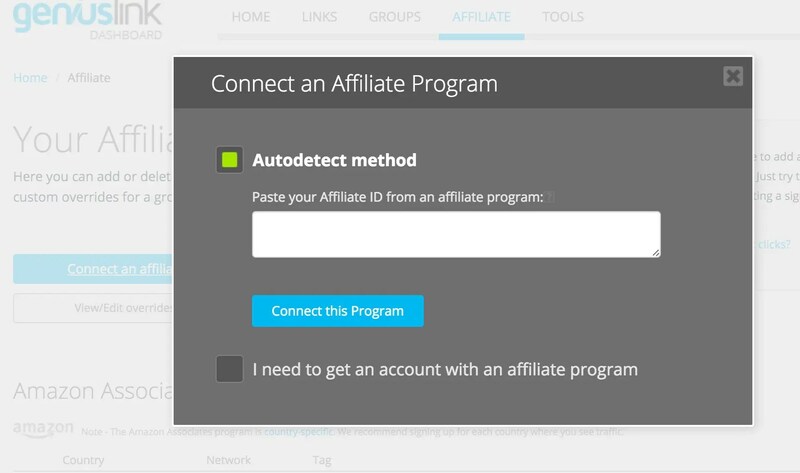 I don’t currently use this plugin, but do plan on testing it out against using Geniuslink to see if the options available with AAWP increase conversions (my suspicions say yes!). 2018 update: I started using this plugin and I LOVE it! I also like that this is a one-time fee plugin that gets updated regularly. Those are the only paid options, but those are the ones that I think are the most widely used. You can also find some smaller developers offering paid plugins and scripts, if you don’t like the options above. You can also find some free options out there, but pay special attention to the terms of service for these. Most of the time the creator of the free plugin or script will “take” one out of very 10 clicks to Amazon, or something similar, so the “free” cost here can be rather high. These aren’t the only international Amazon Associates programs available, but these are the ones that I find most people sign up for (including myself). Signing up for an account with these is just like with Amazon.com’s program. And yes, you do have to sign up with each one separately. Getting yourself all set up with the accounts for each Amazon Associates program is only part of the battle here. Next, you need to be able to get paid from them when you make some sales. For Americans like me, this is a bit tricky. You can choose to be paid by gift card, but the catch is that the gift card is only good for whatever Amazon site you earn from, so you could end up with an Amazon.de gift card that does you no good. Fortunately, you can get paid by direct deposit via Payoneer for all the Amazon Associate programs except Amazon Associates Canada. Even people outside the United States can use Payoneer to get Amazon.com affiliate payments via direct deposit! If you don’t have a Payoneer account yet, sign up here and get $25 free once you get a $100 payout! I use Payoneer for all of my international Amazon Associates payments except for Canada. In order to get paid via direct deposit for my Amazon Associates Canada income, I actually went to Canada and opened a bank account there. Many of the banks in Canada allow non-citizens to open a CAD bank account with as little as $10 CAD to open the account. I use TD Canada Trust for my account, but I’ve heard good things about BMO Bank and other large Canadian banks. Based on my experience using a few different geo-targeting plugins and scripts, they all work in the same basic way. If you have a link to a product on Amazon.com on your website, then the plugin or script will notice the geographic location of the visitor (based on IP address) and then route that visitor to the same (or similar) product on their local Amazon site. Obviously this is not a 100% foolproof scenario since all of the Amazon sites don’t sell exactly the same products, but it works well enough to be worth your time. Though I haven’t experienced it, there are reported instances of these plugins and scripts not playing well with caching plugins. In fact, several months ago there was a thread on the JustStart subreddit where someone who was using Thrive Content Builder with Geniuslink had some major issues with caching and the links not being properly credited to his Amazon account. Fortunately, that got all worked out and isn’t supposed to be an issue any longer. I can tell you that I use the Geniuslink plugin with Siteground’s caching plugin, with Cloudflare, and with the W3TotalCache plugin and have zero issues so far. 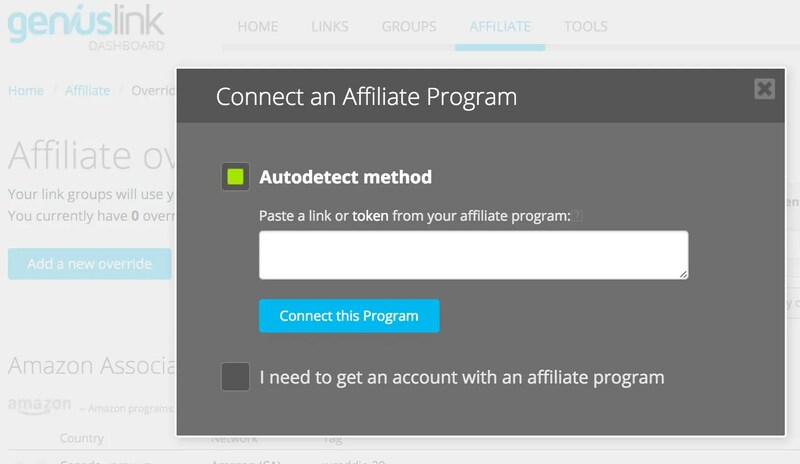 Then you’ll have to click on “Connect an affiliate program” and enter in a product link with your tracking ID for each of the different Amazon sites to get all the default tracking IDs in the account. And yes, you can only do one at a time. Once you input the link, it will attempt to auto-recognize the program it is for. This isn’t always accurate so you might have to manually select the proper program that matches the link. 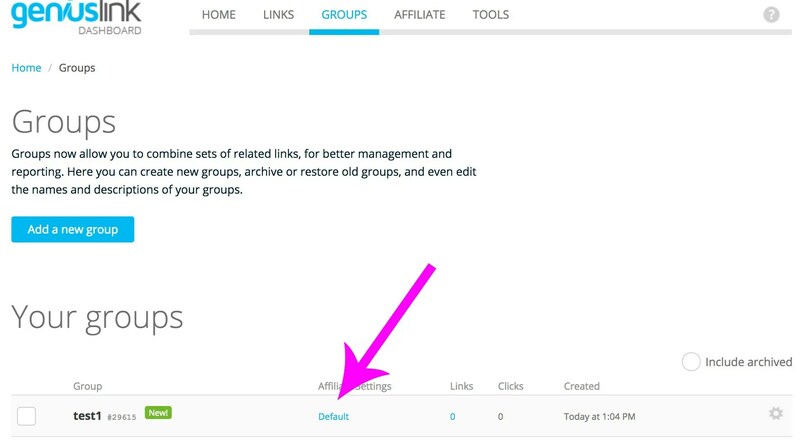 Now that you’ve got in the default tracking IDs, you have to set up “Groups” so that you can add in the tracking IDs for each of your affiliate sites that you want to use Geniuslink with for boosting your Amazon income. Click on “Groups” at the top of the page, and then click on “Add New Group” to get the popup where you can name your group. I name it with my site name so that it is easy to identify. Now, you have a new group for your site, but you have to create “overrides” to add in the site’s Amazon tracking IDs. If you don’t create the overrides, then your site will use the default tracking IDs that you’ve already entered. To add your overrides, click on “Default” and that will take you to the overrides options for that specific group. Once there, you have to click on “Add a new override” and then you enter in the links with the proper tracking IDs, like you did to get the default IDs added. Yes, getting this all set up is super tedious, especially if you have a lot of sites where you use the Amazon Associates program. But once it is done, you never have to do it again. Now, once you have your groups all set up for your sites, it’s time to get the plugin added to your sites and configured properly. The Geniuslink plugin is called Amazon Link Engine. Install and activate the plugin. Then, head to Settings–>Amazon Link Engine in your WordPress dashboard. Now you need to add in your API and secret key. Find them in your account at: https://my.geni.us/tools#api-section Once you have them entered, save the changes. 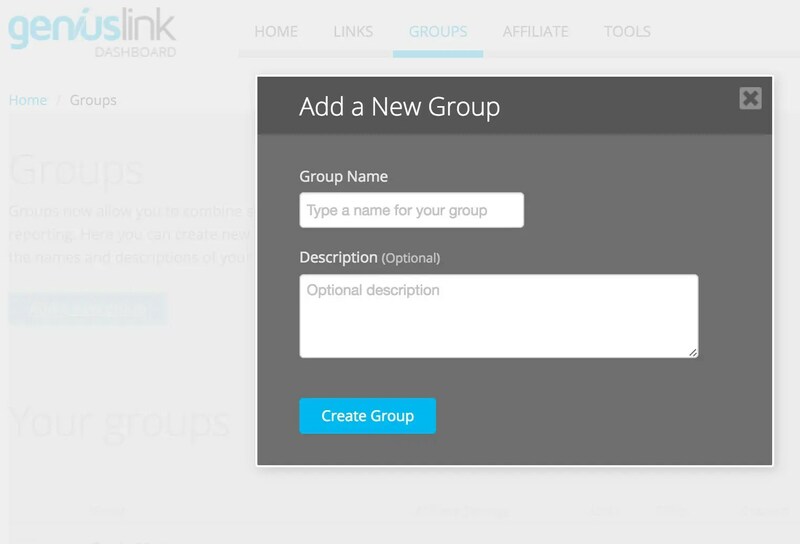 Once you save the API and secret key, you have the option to select your links group that matches your site. So, select the link group to use and save your changes. That’s it – you’re now all set up to start earning from the other Amazon Associates programs with Geniuslink! Awesome article and thanks so much for sharing our service with your community. We wanted to reach out and let you know that we just launched a new pricing structure with the goal to help our clients become better marketers. We no longer have multiple “plans.” Now, Geniuslink users simply pay for what they use in buckets of 1,000 clicks for $2 each.